Home / Unlabelled / DEF CON 26 - Josep Pi Rodriguez - WingOS: How to Own Millions of Devices . 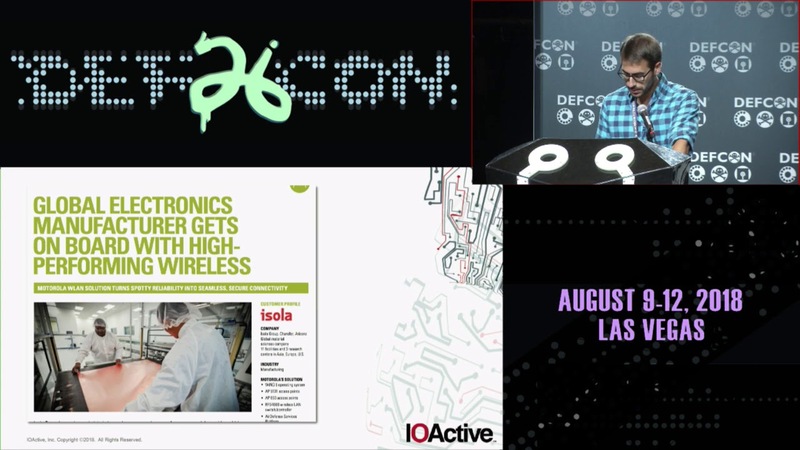 DEF CON 26 - Josep Pi Rodriguez - WingOS: How to Own Millions of Devices . Extreme network's embedded WingOS (Originally created by Motorola) is an operating system used in several wireless devices such as access points and controllers. This OS is being used in Motorola devices, Zebra devices and Extreme network's devices. This research started focusing in an access point widely used in many Aircrafts by several worldwide airlines but ended up in something bigger in terms of devices affected as this embedded operating system is not only used in AP's for Aircrafts but also in Healthcare, Government, Transportation, Smart cities, small to big enterprises... and more. Based on public information, we will see how vulnerable devices are actively used (outdoors) in big cities around the world. But also in Universities, Hotels,Casinos, Big companies, Mines, Hospitals and provides the Wi-Fi access for places such as the New york City Subway. In this presentation we will show with technical details how several critical vulnerabilities were found in this embedded OS. First we will introduce some internals and details about the OS and then we will show the techniques used to reverse engineering the mipsN32 ABI code for the Cavium Octeon processor. It will be discussed how some code was emulated to detect how a dynamic password is generated with a cryptographic algorithm for a root shell backdoor. Besides, it will be shown how some protocols used by some services were reverse engineered to find unauthenticated heap and stack overflow vulnerabilities that could be exploitable trough Wireless or Ethernet connection. This OS also uses a proprietary layer 2/3 protocol called MiNT. This protocol is used for communication between WingOS devices through VLAN or IP. This protocol was also reverse engineered and remote heap/stack overflow vulnerabilities were found on services using this protocol and will be shown. As a live demonstration, 2 devices will be used to exploit a remote stack overflow chaining several vulnerabilities as the attacker could do inside an aircraft (or other scenarios) through the Wi-Fi. As there are not public shellcodes for mipsN32 ABI, the particularities of creating a Shellcode for mipsN32 ABI will be also discussed.